… no matter how much you think you know better… you probably don’t. The story knows. This may not be true for everyone, but for me, it really is: my stories write themselves, and if I try to go against them, I get stifled. I’ve been reminded of this fact a couple of times recenty. A few weeks ago I had an idea for WT. I thought “That’ll be really cool, and according to well-established story beats, a good time for that to happen would be… later in the story.” Cool, I thought. I have something to work towards. I kept pushing on, telling myself “Come on, write, there’s good stuff coming.” Not that I thought what I was writing at the time was terrible, or even bad. I was just struggling to find momentum in my writing. Clare Davidson is an independent writer, based in Lancaster. Clare is a high school teacher, mother and character-driven fantasy writer. Clare was born in Northampton and lived in Malaysia for four and a half years as a child, before returning to the UK to settle in Leeds with her family. Whilst attending Lancaster University, Clare met her future husband and never left. They now share their lives with their young daughter, a cranky grey cat and an insane white kitten. She published her first novel, Trinity in July 2012. Trinity is a young adult, fantasy novel, which currently has seventeen five star reviews on Amazon UK. Her second novel, Reaper’s Rhythm, is due to be released on the 26th July 2013. Also aimed at a young adult audience, Reaper’s Rhythm is an urban fantasy with a dash of mystery. As you all know, after umming and ahhing over whether to pursue a traditional publishing deal or go it alone, I finally settled on a compromise: I signed with a small press. For me, it gave me the best of both worlds: a little hand-holding, but not quite as big and scary as the full publishing world. I have got to say, if you can make it big in this world, the rewards are great. I’d love to believe I can, but the reality for many of us is that we’re not gonna shine quite that bright. Even so, we can shine… we can publish, we can be read, we can be loved. And so I’ve published. I have fans now… really. One or two, anyway. I’m not going to say I don’t ask “what if”… What if I’d aimed for a bigger deal? And so, I wonder… what would it be like to work with an agent? What doors do they open? What doors do they close? To help me, and any other writers curious about such things, Eric Ruben agreed to do an interview with me. So, you’re a lawyer, literary agent, talent manager and a stand-up comic? (Who wouldn’t want to work with you? is my question…). What did you want to grow up to be when you were a child? I remember wanting to be the President, a talk show host, a comedian, talk show host, race car driver, actor, rock star. You’ve managed to tick a few off that list… Presidency might be just around the corner! In today’s world, writers have more options than ever before: holding out for a Big-5 deal, approaching small publishers, self-publishing, or serialising their work on a blog. With all these choices, and the chances of acceptance by an agent/big publisher so small, you can see why authors might choose the other channels. In talking to other writers, the biggest disadvantages of working with an agent, and pursuing a big traditional deal, seem to be: sharing a percentage, and the long wait between selling a book and seeing it on bookshelves (vs. clicking “Publish” on Amazon…). What do you feel an agent has to offer in this ever more competitive market? Now, I’m lucky enough to have read an e-ARC copy of REAPER’S RHYTHM, and I found it highly enjoyable — finishing it within a couple of days (and that’s saying something, given my timetable). If Paranormal YA is your thing, I definitely recommend it. But even if it’s not your preferred genre, I think you’ll get a kick out of this one. REAPER’S RHYTHM releases 26th July 2013. 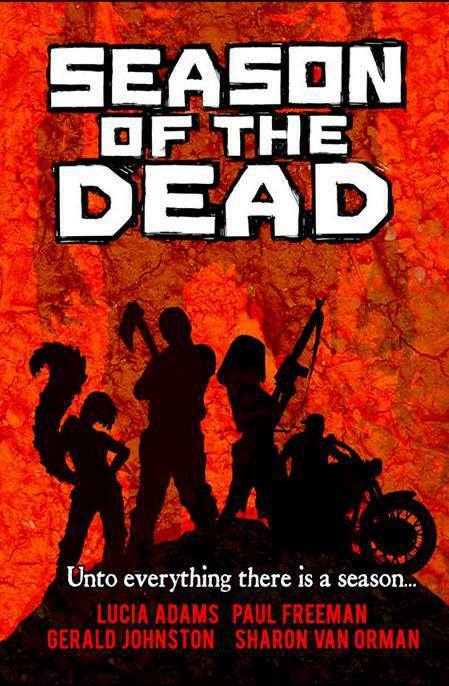 SEASON OF THE DEAD from Lucia Adams, Paul Freeman, Gerald Johnston and Sharon Van Orman. As writers, we’re pretty well used to interacting with “people” via text… it’s how our characters live. We write/type, and they live. But what if the only way you intermingle with other writers is through the internet: WDC, Twitter, Facebook, G+… whatever…? Are they real? Or have you made them up? Am I real? Or are you just imagining me? Several years ago I finally discovered why I had been feeling so “odd” as I clawed my way through day-to-day life and went to work, blah blah. You see, I rediscovered my writing bug. I started penning a story. When it started to grow into something more than “just a story”, I joined WDC and combed through various websites looking for the advice and experience I needed to shape my story into a NOVEL. My best progress was made through the more personal relationships I formed both on WDC and on other sites (I found my strongest supporter on Jottify). It’s all good and well sending a review here and there and getting the odd one back, but there really is something about forming allegiences with other writers with the goal of helping each other succeed in whichever way they wish. And just so’s you know… HEALER’S TOUCH is actually 99c (USD) NOW! In celebration of their first birthday, Kristell Ink are running a Writing Challenge to give you more chances to win prizes! (More chances? More chances? Yeah, the Rafflecopter is still running). In 500 words, we’d like you to tell us a fantasy/science fiction/steampunk/ subgenre story involving something with a feline feel. Grim and Bold will be judging, along with Alex Shepherd (reviewer for Fantasy Faction and all around fantasy lover). Once a shortlist is decided, we’ll bring along Adam Dalton (Gollancz author) and decide on the top three. In the event of a split decision, we will turn to Mark Lawrence (Harper Collins author) to make the deciding decision. Yeah…. They have awesome judges lined up. So hop to it. 500 words isn’t too hard. Well… yeah… for someone who prefers novel-length writing, 500 words is very hard. Still, it’s worth giving a go. Kristell Ink (Grimbold Books) are giving away Swag! Check out the Rafflecopter Giveaway on This Page to get in on the action. (It contains java script, so I can’t post it directly here). Cheap (in price, not quality) Ebooks This Weekend! Check out the Competition Page on Tim’s Blog for details of how to win: Signed paperbacks, free eBooks, and Amazon gift vouchers!